One of my childhood dreams was always to visit Graceland. 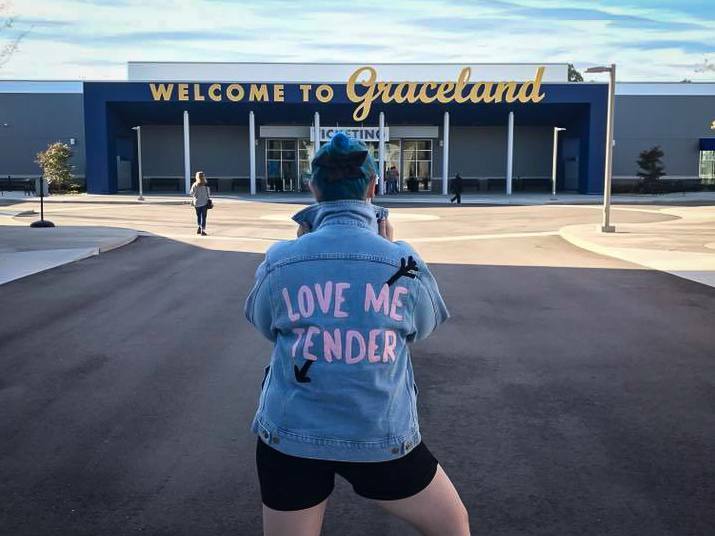 I never thought I’d ever make it there, but in October 2017, I made my dream come true and spent a good nine hours at Graceland as part of my Trek America. The Trek we took part on had a Graceland ticket included that was just your standard tour that costs around £45 which includes the Mansion and Plane; this is the tour that Mike went on. What do Tickets Include and Cost? Being the mega lifelong fan that I am, I decided, along with Keeley who was also on my trip, to upgrade our tickets to the Ultimate VIP Tour which cost around £150 for the day; this ticket included a Graceland Mansion Tour with an expert guide for up to 10 people, a self-guided tour of Elvis’ Custom Jets, Presley Motors Automobile Museum, Elvis: The Entertainer Career Museu, a self-guided tours of the Elvis Discovery Exhibits and an exclusive VIP exhibit. On top of all of that, we also got access to the Ultimate Lounge all day if we wanted to grab a drink and chill, special merchandise that was only available to those on the Ultimate VIP Tour, a meal voucher for Vernon’s Smokehouse including a meal, a drink and ice cream, a Keepsake Backstage pass a Personal Graceland Archives show and tell session that I will talk more about later and plenty of photo opportunities that aren’t open to everyone. I think it was well worth every penny I paid, others think I’m crazy but let me tell you more about my dream day! Upon arrival, we headed into the ticket desk to upgrade our tickets which was super easy. We then were left to our own devices until our tour began a little later in the day. 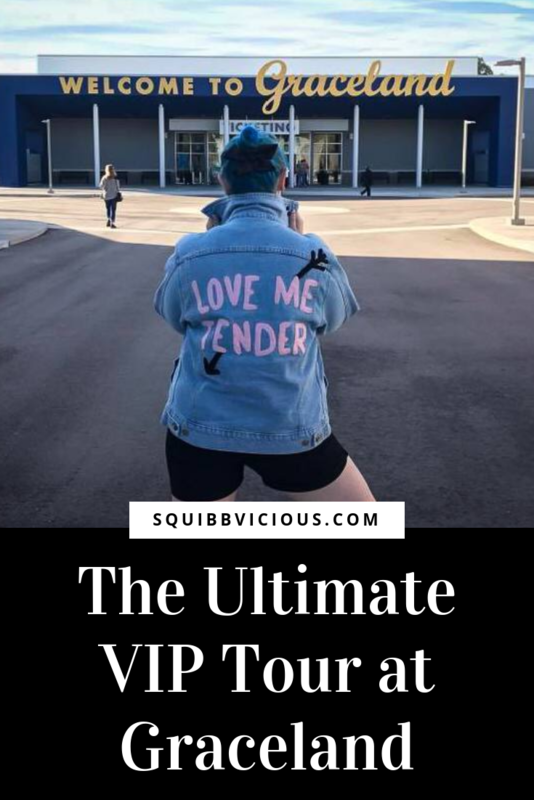 During that time we visited all nine merchandise shops as all of them stock different items and we wanted to make sure we bought exactly what we wanted to remember our trip and didn’t miss out! We also took our self-guided tour around the planes that are parked just a short walk away from the ticket desks. It just felt so surreal to be wandering around the planes that Elvis himself had been on! I had to keep pinching myself to make sure I wasn’t dreaming! Elvis purchased his 1958 Convair 880 in April 1975 and he named it after Lisa Marie, his daughter. He spent more than a whopping $800,000 having the jet remodelled. Elvis’ smaller Lockheed Jet Star, that is also on display, was customised by Elvis with a yellow and green interior and was mainly used by Elvis’ manager and staff! We also took in all the exhibitions that were open to us and I was on full Elvis overload. I can’t count how many times I Facetimed my parents to show them something else I’d found that would want to see! 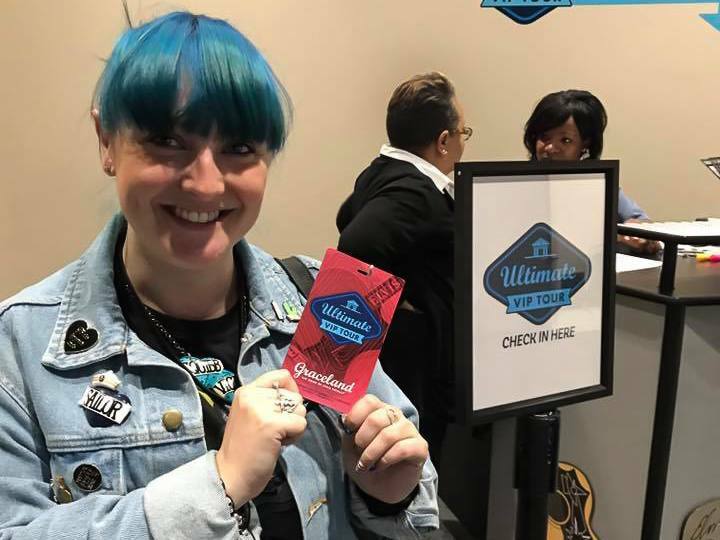 At our allocated time, we made out way to the Ultimate VIP Tour check-in desk and met the rest of our group. It was great how the older people on our tour enjoyed how we were fairly young but had such an interest in Elvis! Due to the tour we had picked, we had our own private bus take us over to the Graceland Mansion and a private screening of a pre-tour video. When on the other tours, you are required to queue for the bus with all other visitors and your tour was via audioguide, whereas we had our own personal guide. We were taken around the mansion, room by room, and the room we were in was shut off to any other visitors which made this day even more crazy. Just a mere 10 of us, stood in Elvis’ living room being told stories from times gone by, looking as though he’d never left. 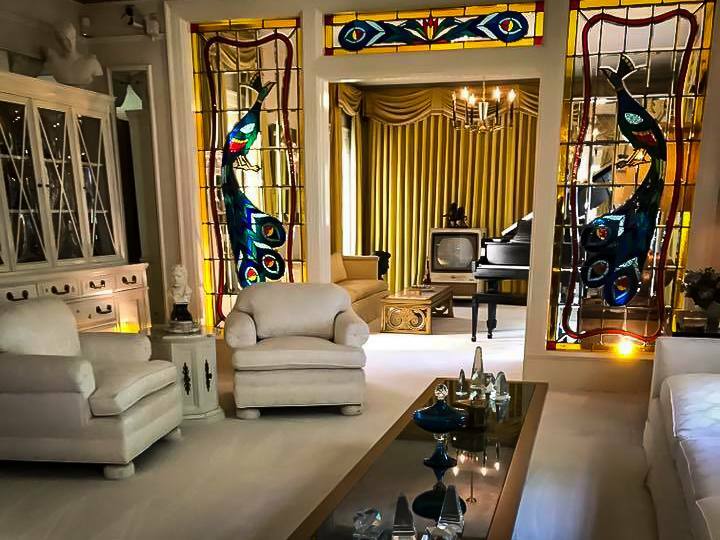 We were allowed to see all of the downstairs of the house and it was just incredible to see the kitchen Elvis would have had breakfast in and the ‘Jungle Room’ that I had sung about so many times when belting out ‘Walking in Memphis’. 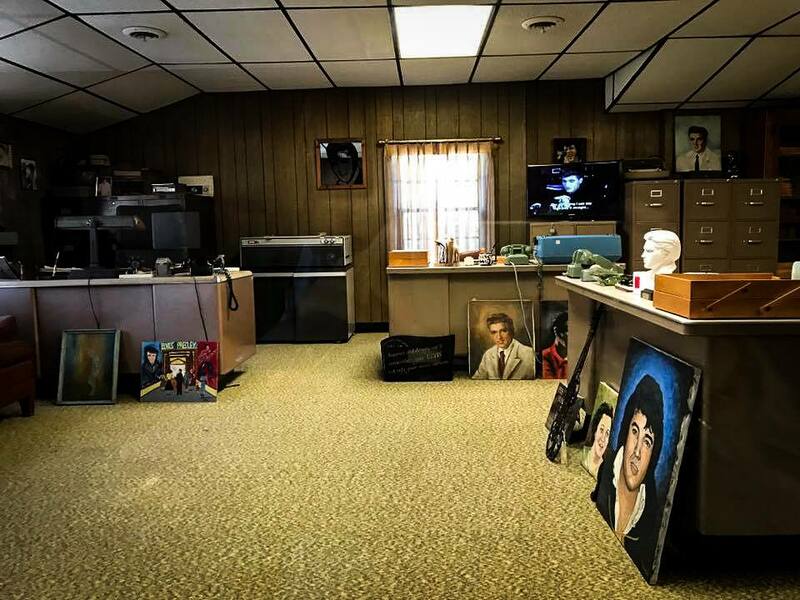 Aside from the downstairs of the mansion, we visited the office in which Elvis was managed from and has been left as it was with a few fan arts displayed. We also saw the swimming pool, the stables and all of the outside areas of Graceland. But most poignantly, we were able to visit Elvis’ grave that is surrounded by his parent’s graves and this was the most surreal and heartbreaking part of the day; I can’t actually put into words how it felt to be there. 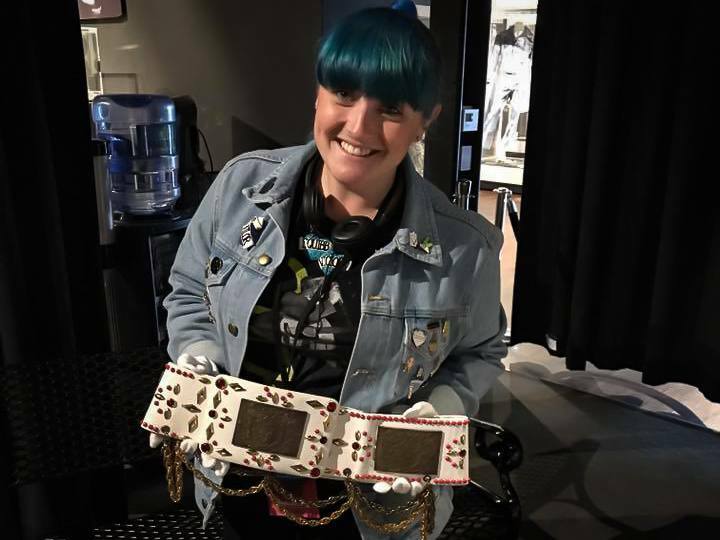 From the mansion tour, we were taken to our personal Graceland Archives show and tell session, and I got to hold a belt that had been work by Elvis himself. We also got to see a lot more clothing that he had worn that wasn’t on display. I remember feeling like I’d lost my mind at this point, I was actually HOLDING ELVIS’ BELT. I couldn’t share the photos with my friends and family quick enough! This was a big part of the day for me and wasn’t something I was aware of when I bought my ticket for the day so it made it even more worth the money! We were then left back to our own devices; we went to eat at Vernon’s Smokehouse and to have 10 minutes to get our feet back on the ground as I’m sure we were floating around all day! We also can’t believe how quick our nine-hour day went there and I could have happily spent a lot longer there in all the exhibitions that were open to us, but we had evening plans with the rest of our Trek group so piled up with souvenirs we left Graceland behind. But oh what an incredible day it was!